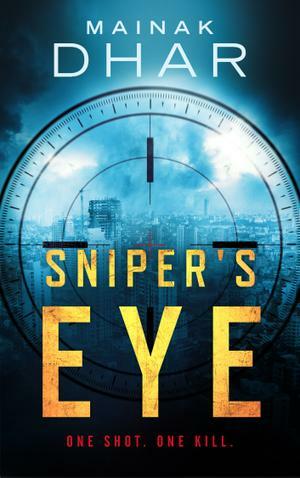 “Sniper’s Eye” – ARC Review | Cleverly Crafted.. I was out on a date. Everything was perfect…Till that shot. .a high-calibre one, no apparent sound. And, the man in front if me fell. A rifle with a suppressor? A sniper in the middle of a Mumbai mall? As the body count mounted, I was soon sucker deeper into the chaos unleashed by that shot. To survive and save those whom I care about,i have to become the man I left behind. I have no choice but to tap into a bloody past that has put me on the terror kill list. I may also have no option but to join hands with the sniper terrorizing Mumbai. The problem is that the man has sworn to kill me. In a world where the young and poor kill and die on conflicts started by the old and rich,i and my unlikely companion finally discover the thin line that separates a mere killer from a hero. This is our story..
Sniper’s Eye is the first book in the 7even series by Mainak Dhar and I think it does a good job of making the reader interested in the upcoming installations. The story unravels in installments with twists and turns coming every now and then. Even though I felt the thrill and there were lots of overlaps created with the current political scenario to make things interesting, I did not feel that level of being on an edge. However, I must mention the cleverness with which it has been crafted to make it feel real even if you are only mildly knowledgeable of the Indo-Pak-Afghan politics. You can actually map the characters with certain figures.. which was amazing! The characters were well-written and there was just the right amount of information about each as and when required. I really enjoyed reading about the Sniper.. much of which will be a spoiler if I told you anything at all..
Like, share and follow for more such reviews! Next Post “One Part Woman” – Book Review | The ugly face of society.. I love how you’ve designed your blog! Sounds like a an interesting read! “Fireside Chat with a Grammar Nazi Serial Killer” Book Review | Scary Psychology issues! “The Dark Side of The Moon (Volume 1)” – Book Review | Totally Spooked me out! “The Glass House” Book Review | What but glass are our dreams made of!! “Dharmendra: A Biography: Not Just a He-Man” – Book Review | The Reality of the He-Man..
“A Voyage through the Echoes” Book Review | Travel time! !